[tweetmeme source=”connergo” only_single=false] I ventured once again outside my comfort zone yesterday here in Havana: I went to mass. It was as oppressive (and let’s be frank – hypocritical) as I remember from Jesuit high school (see note 1), although this one was presided over by the big Catholic kahuna himself, Pope Benedict XVI. It was also mercifully short. While I’m sure you’re oversaturated with ‘The Pope in Cuba’ news up your way, one of the indelible lessons I’ve learned in my 10 years of island residency is that the picture you get of here from there – especially when refracted through the lense of reporters sent to cover such an event – does not accurately reflect what we’re experiencing on the ground. It’s not only that every media outlet from The Militant to FoxNews has an agenda. The view is skewed also because Cuba newbies rarely grasp the complexities of our context (see note 2), nor the attendant history influencing those complexities. You don’t get this perspective unless you’ve been around and stick around and only if you speak Spanish – even a translator is no guarantee (see note 3). What folks are saying: One of the pervasive myths about Cubans is that they’re afraid to speak their minds or offer opinions, and that self-censorship is rampant. While it’s undeniable that people keep their heads far below the parapet in the workplace and have the tendency to adjust responses to what they think people want to hear, I’ve always found Cubans to be fiercely opinionated – once you get to know them. Or more to the point: once they get to know you. Rocking our rum-pork-party holy trinity: Another element piquing my interest was how Cubans approached this whole Papal visit. Essentially, yesterday felt much like hurricane preparation and landfall: people laid in stores and stayed home watching events unfold on TV, with some chicharrones and a bottle of rum close at hand. Except – and this was a rude awakening for several of my unprepared friends – authorities instituted a booze ban the evening before, which lasted until the Pope Mobile and its cargo were safely at the airport. So those who didn’t lay in the ron were homebound with pork, friends, and family, but no curda. In my decade here, I only recall a few alcohol-free events: election days are always dry and if I’m not mistaken, they did the same during the Non-Aligned Summit here in 2006. Let me tell you: no rum makes Havana kinda grumpy. Revenue coup: The cleverness of Cuba never ceases to amaze me and yesterday didn’t disappoint once I saw the huge numbers of tourists in the Plaza for mass. My first clue was the distinguished older gentleman of means dressed in khakis, a pink Oxford, and penny loafers, with not a gin and tonic in sight; clearly not one of us. I started looking closely at the crowd and their clothes and distinguishing different accents. Nicaragua, Argentina, Chile, Panama, the DR, USA, PR, Mexico, Venezuela – flags from all across Latin America snapped in the wind whipping across the Plaza and I realized that aside from the pride and so-called “soft power” the Papal visit signified, it also represented a hugely-needed and greatly-appreciated influx of tourist cash. There wasn’t a hotel room to be found; paladares overflowed; extra charter flights were added from Florida. And all Habaneros (save for cops and docs), were given a paid day off. This is the type of devotion we could use more of and we thank you for supporting the cause. The US matters less: After Juan Pablo II’s visit in 1998, Bill Clinton’s White House issued a press release announcing new policies ostensibly resulting from this historic trip. Most importantly, the release approved people-to-people visits in order to foment “regime change” and “promote a peaceful transition to democracy” – concepts mentioned no fewer than six times in the short document. Blatantly threatening the national sovereignty of an independent and peaceful country thusly is absurd enough, but that Obama maintains precisely the same policies and parrots exactly the same rhetoric 14 years later – that’s just loco. While the US is embarrassingly and unjustly static in its policy, the world and importantly, Cuba has changed, is changing still. Raúl is a different bird from his brother and that manifests itself in many ways, including less of the ping pong policy-making that based decisions on what the bully to the North was doing. That’s how it looks publically anyway. As anti-climactic as the Immaculate Conception: I’m sure you’ve already divined that the religious importance of having his Holiness here held no interest for me and in this I’m not alone: I’ve never seen an event so thinly attended in the iconic Plaza de la Revolución in my 10 years here. In fact, we strolled into the central area just a few moments before the 9:30 mass kicked off and were going against the current of people streaming away from the square. “I came and took the pictures I wanted; I’m going home,” a friend I ran into said. The curiosity seekers and thin crowds were surprising but make sense: as a whole, Cubans just aren’t that church-y. Religious and faith-bound, yes, but that’s different from kneeling before a man in a dress and goofy hat while he proselytizes a doctrine peppered with sins bound to doom your mortal soul. 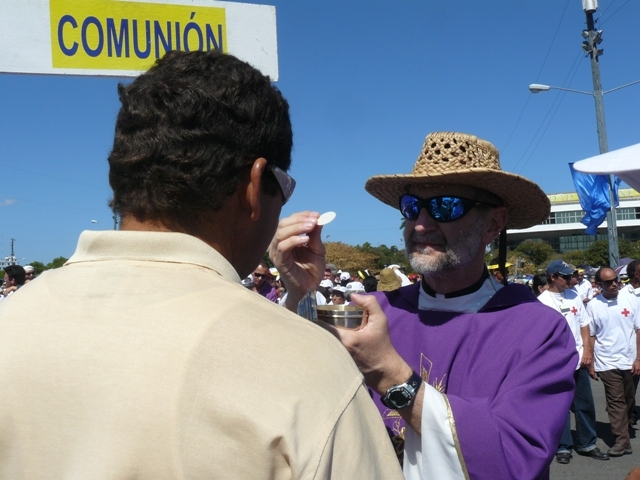 Cubans just aren’t down with that, but they do love a spectacle: one of my favorite moments was when a women who wanted to taste the host tried to fake her way through the motions while the priest held the wafer aloft. When he caught on, he patted her on the head and returned the host to his jaba. Though the Pope himself failed to inspire, Cubans never do. Great to wake up on a Sunday morning and see a new “Here is Havana” post in my inbox. I was waiting eagerly to hear your opinionated scoop on the Guy in the funny hat’s visit. I recently made my first trip to the island, ‘facilitating’ for a National Geographic P2P visit, and will return again in mid-May and June for repeats. Before this opportunity manifested, I knew very little about Cuba. My one prior connection to the island was the music. From Orishas’ hip hop, to the Bob Dylan like allure of Silvio Rodriguez, and, of course, the revived Buena Vista Social Club’s sons and guajiras, Cuban music gave me my first glimpse into Cuba’s societal values. Now, after my visit, I cannot stop obsessing about the island. Ive been devouring anything I can find about it including black and white youtube videos of Fidel’s early speeches. People ask me constantly “What is going on in Cuba”? and I proceed to spew a bunch of what I saw and learned, but ultimately say that I am confused by the disparities, dichotomies, and my own false preconceptions of the island. Needless to say, I am hooked now but feel ignorant and in need of real insider information. I appreciate your perspective and candidness. We to the north need a ‘vista’ from someone who has lived in Cuba with continuity and who is not afraid to share their in-the-trenches observations and insights. Please keep the ‘navel-gazing, cathartic rantings’ coming. Hi Alex – glad you found my blog. can you turn your trip participants on to it? This is JUST the type of folks Im trying to reach and I think their trips will be richer for it. Also, those big $$$$ natl geo travelers can splurge $2.99 on my app, no?! Dale! One thing I oft repeat is that I knew less about Cuba after living here 5 years then I did after 1. It’s one of those kind of places – addicting and confusing in equal measure. Regarding note #4, I have no doubt that, like most things Cuban, internet availability, at least in terms of the “big pipe” country to country connections, is affected by the embargo. I also have absolutely no doubt that the difficulty of most people, in obtaining a workable (ie: high-speed) home connection or any connection for that matter, is the direct result of a government deeply afraid of both freely accessible information, and of nation-wide, instantaneous, free communication. How else to explain the extreme restrictions on getting a connection…..and the prohibitive fees charged for an extremely poor product. Though they were thinking and acting in terms of controlling the information flow long before the events of the last year, in North Africa and the Middle East, I’m sure the Habana Junta sat up sharply, and paid attention, as they saw the lessons to be learned by authoritarian regimes from the Arab Spring. Given what I have read of your writings, both hear and on the TTF, I don’t think you and I will find much to disagree about here; but…..given that those interested in the real Cuba have to regularly try to reconcile two equally fantastical visions of Cuba…the one presented by 50+ years of repressive American regimes……and the other, also a greying oldster, now propagated by Hermano Raúl; I think it is important to never separate the two…the embargo and the Cuban regime…and mention only one. I cannot think of any of Cuba’s current woes that are not the responsibility of both. I have spent most of my life thinking that the embargo was the classic definition of insanity…..the chronic repetition of an action that produces only negative results….and I have heard far more than one Cuban say; “La revolución murió en 1969. Thanks for writing in J with such measured opinion. Also, on the prohibitive fees: this is supply and demand no? small supply + high demand = high price. Cuba is a poor, poor country (in $$ terms) and I bristle at folks (and Im guilty too, so not throwing stones here) who begrudge them trying to get 2 nickels to rub together. Internet access is not a right. Food? Health? yeah. Pinarest? Not so much. But that’s a different conversation altogether and I digress. Bottom line? The Cuban revolution has done many things wrong, but has turned a neat trick getting many very big things right; you take the good with the bad and Im taking all I can get! Nicely written, as usual.i loved your answer above that you knew less about Cuba after 5 years than after 1. Classic! About the Internet- i disagree with you- i don’t think the Masters will ever let an average Cubano have an uncensored hook up in his casa. They have an ingrained need to control all the info that is dispensed. We will know more about this if they ever get the ALBA-1 cable from VZ up and running. The word i have on that is that pichons from ETECSA were involved in a little hanky-panky with the contracts, and ended up with a cable which had a faulty casing, and was not sufficiently waterproof. There is doubt whether it will Ever be functioning, and if they do get it operational its life will be short. I understand quite a few of the jefes from ETECSA are Jailed, and will be getting stiff Prison sentences. The “average Cuban” has more ways to resolve internet than even we know! And yes, there was a corruption kerfuffle around the cable recently…..
You are responding quite well, so i believe you. i would bet you are smarter than the average bear about how to get things done, Internet-wise! I can hardly believe, with the knowledge of this technology, that an incorrect cable got laid that distance, at that expense. Does anyone know if the Jamaicans got their portion working, at Ocho Rios I believe? ….fiercely opinionated? Anyone that’s ever shared a meal or an afternoon (con chicarrones and ron) with a Cuban family knows……When I first met my American husband’s family, they took turns talking and interruptions were frowned upon. Even though they were a part of my life for a long while, they soon learned that I was not capable of following those rules. In my familia, if you want to have your word, you have to raise yourt decibel level. There’s just no other way…..
hahaha! you’d be right at home w either my Cuban OR New York family. We are LOUD, talk over each other, interrupt and gesticulate….. I always read your blogs with a smile. You have a great sense of humor and you always speak from the heart, which seems like a genuine and good place. I love how you find the island endlessly confusing, endearing, exasperating and fascinating. These are traits that most Cubans have. Minutes within meeting a Cuban, you will fall in love with them as a human being and minutes later wish you could beat them unconscious with your shoe. It’s a love hate relationship I have with my own family. Cuban politics is no exception. My family was the prime example of the Cubans the revolution was catered for. My father was a plumber and my mother was a housemaid for the rich folks. Batista and the old regime were not exactly working for us. My dad ( E.P.D.) never bought into the revolution my mom was very pro Fidel at first. My dad appreciated the social benefits it would bring, but he had no animosity towards the bodegeros, small business owners and farmers that were working hard as he was. They did not just stick it to the rich. Rights and freedoms did not exist under the old regime either, pero coño the new guys took the cake. We had no money or way to leave, so dad had to escape with a small boat he liberated from one of the mansions in Varadero. We were reunited four years later in the so called Freedom Flights of the 60’s. All I wanted to say Conner is that Costa Rica did the same thing ten years earlier the right way. Figueres did not stay in power. He over threw the corrupt regime, abolished the army, made land reforms, health care for everyone ensured it would stick after he left and returned the country to a constitutional democracy. Socialism and economic reform is one thing, but the Cuban revolution took away much more than it delivered. The right to health care, education, housing, is given to every inmate in a Scandinavian country. Cuba these days is not exactly the large prison it used to be, it still has a long way to go. Let’s hope the embargo ends soon and Cuba can go from revolution to evolution and turn into what Fidel and everyone since Marti promised. Con todos y para todos. Thanks for sharing your story Nelson. Families torn asunder is the saddest chapter in this whole saga – I don’t care who is responsible. On your Costa Rica observation, I don’t quite agree, however: it is known as the “51st state” after all for its “let me bend over for you nice and slow” stance vis-a-vis the US. And this has effects on a place – for example, what do you think when someone says “Costa Rican culture?” or “Panamanian culture” for that matter (Islas San Blas/Kuna notwithstanding). And we’ll have to respectively agree to disagree that “the Cuban revolution took away much more than it delivered.” Besides, by what matrix or methodology could we even draw such a conclusion? It’s a circular argument. I do appreciate your input – it shows that moderated discussion around this topic is possible. Thanks for the reply. Your right no one can ever have an economic or social formula that can clearly show the gains or minuses of before and after the revolution. I just wanted to add one story and one opinion. Besides, not only do I think that the topic can be discussed in a civil manner, but that it is crucial for all sides to hear each other and not shout past each other. The old Cuba and its ways had to go. I just wish that the revolution had not been so vindictive and extreme. They ended a hateful and violent system with even more hate and violence. Pero, no hay mal que por bien no venga Yes, I will use the H word. Human rights should not be an argument in favor of basic human needs. It should not be either or, but both and. As far as Costa Rica, I am not so sure they are being screwed by the U.S. Can it be possible that they simply get along with el monstro del norte. Must everyone be like Chavez? How about Brazilian ex prez Lula? Not exactly a buttoned down conservative. Yet he wasn’t frothing of the mouth every time he spoke of the US. Nor did he feel he had to be a US cheerleader. I know, I know, each country is different in economic size and history vis a vis the US, but you get my drift. Any way, I can only have love for Cuba, those that felt betrayed by the revolution, those that gave it all they had, and all those stuck in the middle. Let’s hope that when the old geezers on both sides of the straits die off, the newer generation will be less hateful and can find a better way of doing things. Ending the embargo would be a good start. I agree completely with you that what the world needs now is more love, less hate. All around. This is a dictum Im trying very hard to follow these days. I came across your blog and love it! Thank you and keep the posts coming please! I’m disgusted this morning learning about Ozzie Guillens suspension in miami- but not surprised. We are not a free country when there is no freedom of speech and no freedom to travel (to Cuba). Totally pathetic, that Guillen flap. While some folks call the Estados Unidos “the land of the free,” I prefer the more accurate “Estamos Jodidos” the land of let’s chip away at Consitutional Rights. I talk about the Marlin Manager’s comment and retraction on my Havana Good Time FB page. During my visit two weeks ago, Humberto and I were discussing religion and Cuba. I told him that I noticed the churches seem to be full on Sundays and asked if Catholicism is on the rise. He told me that although Cubans may attend church, they are actually praying to their Yoruban gods rather than Jesus and the Pope. Cool!